Today is not a day that we’ll relax. We are going to explore the oil industry’s onshore infrastructure — drilling rigs, wastewater injection wells, and even a tar sands production facility. The last will leave Lupe gasping for breath, clutching her chest, and me terrified that I’ve just endangered the health of an 85-year-old civil rights hero. Lupe has marked time by the ripeness of fruit. Her childhood summers were spent following California’s harvests. She and her family picked apricots around Oxnard, then headed north to San Jose when the plums were ready, and back south again for walnuts. For the first eight years of her life, this was the summer ritual, and the rest of the year they lived in Colorado where her father worked for the railroad. But when Lupe was in third grade they moved permanently to California, and settled by her aunt in Saticoy, near Oxnard. 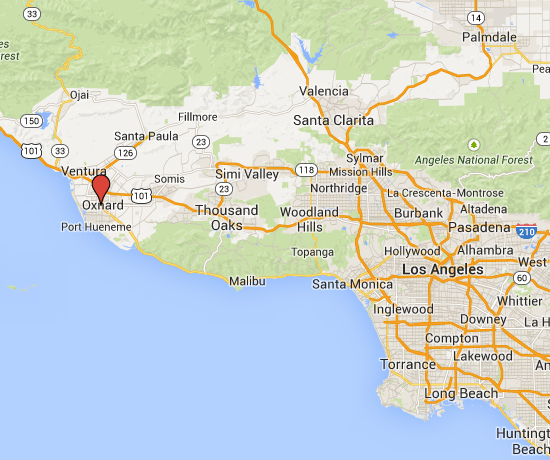 Oxnard, where Lupe lives now, is 60 miles up the coast from Los Angeles. It’s a happy marriage of Pacific beaches and fertile agricultural fields. When Lupe was a kid it was grapevines and groves of lemons and oranges. She still remembers the perfume as she rode her bike from the fields to the beach. Today you’re more likely to see tomatoes, celery, raspberries, lima beans, and Oxnard’s signature crop: strawberries. As we drive from Lupe’s home to the ocean we pass fields and fields of strawberries. And among the green rows, there are also drilling rigs — tall, white and ladder-like. “There, do you see that one and that one?” she asks, pointing to the rigs, “and look at the signs — they never had those before.” This particular patch of strawberries has a billboard warning trespassers of arrest. It’s likely been erected not by the grower but the driller. This is the new norm. Lupe has seen more and more rigs appearing, she says, and she’s worried that companies may be using well stimulation techniques like hydraulic fracturing — or fracking — to blast apart underground rock formations with a high pressure cocktail of water, sand, and chemicals. Lupe has read the stories of fracking’s impacts in other states — water contamination, air pollution, health problems, dying livestock. A recent Congressional report about fracking fluid found that companies may use 750 chemicals and other ingredients. Some of these may be harmless, but 29 of them have been identified as a known or suspected human carcinogens. And many other chemicals in fracking fluid companies won’t even reveal because they are protected as “trade secrets,” which make understanding the human and environmental health implications impossible. Because of these risks, Lupe is willing to take on the deep-pocketed oil companies by working in coalition with others to limit or prevent fracking in Oxnard and off its coast. It may seem like a lopsided fight, but Lupe is a force to be reckoned with. Don’t let the white hair pulled back into a bun fool you. Or the fact that she used to be a nun. 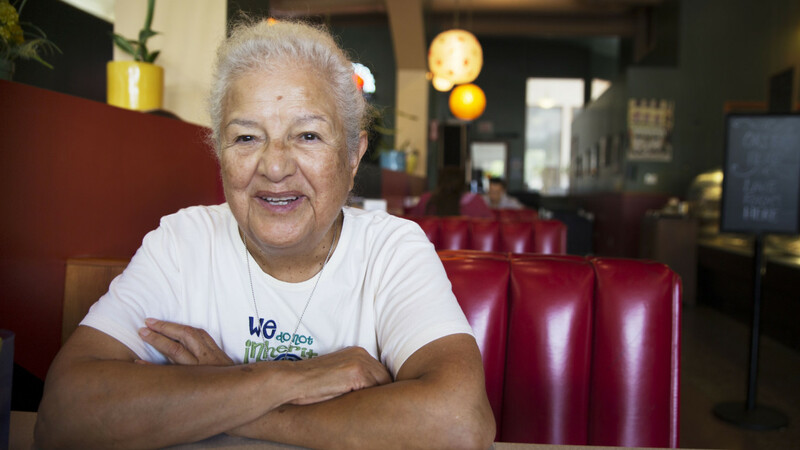 This genetic wiring led her to join farm worker organizer Cesar Chavez, aiding in his legendary grape boycott in the 1960s. Later she worked alongside Bella Abzug and Gloria Steinem on the Equal Rights Amendment and dedicated herself to creating programs to help move women off welfare and out of poverty. Her work drew praise from two U.S presidents. Fast forward a few decades and Lupe has completely failed to understand how retirement is supposed to work. 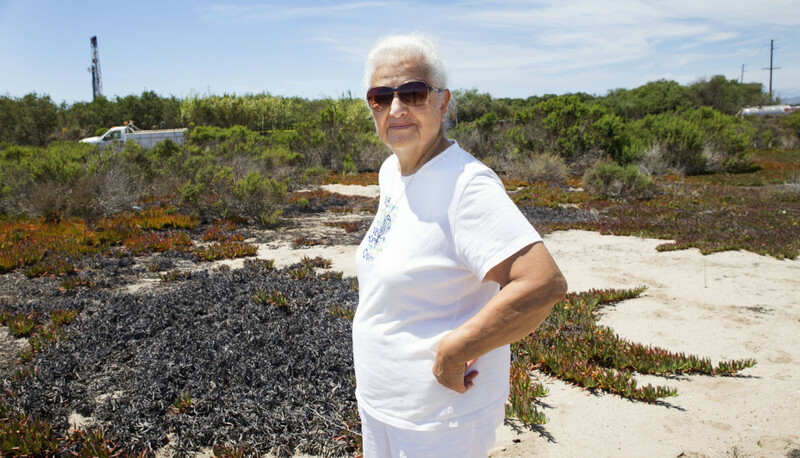 Instead of hanging out by the ocean, she spends her time peppering city councilors with questions about drill rigs protruding from dunes along her beloved beaches. She colludes with organizers from groups like Food and Water Watch and the Center for Biological Diversity, calling them her “angels.” And she has thrown around her weight with the League of United Latin American Citizens (LULAC), the biggest Latin American civil rights organization in the country, and gotten them to take a stand against fracking in California. And to her, fighting fracking doesn’t seem incongruous from the work she’s done before. She’s a big picture activist, seeing the whole of things, connecting issues that often get put in silos: workers, women, poverty, food, water, health, energy. In Oxnard now, she’s showing me how all these things relate. We visit McGrath State Beach on the Pacific Ocean. A drilling rig pokes over the dunes, a half mile from the campground. We (and the rest of the public) are blocked from getting close enough to see what’s going on, but well records indicate that recent permits have been filed to drill horizontally from the beach to offshore reserves. Other wells are tapping onshore deposits below. This small stretch of beach (home to snowy plovers) also has at least a dozen wells already pumping. When we pivot 180 degrees from the water, we can see more drilling rigs across the road where dunes slope to farmland. Lupe suspects the oil companies may frack or acidize these wells. Acidizing is another well stimulation technique — similar to fracking — that involves pumping hydrochloric or hydrofluoric acids deep underground. Fracking breaks apart rock, while acidizing breaks rock down — but both are used to try and coax more oil from underground rock formations. Lupe is concerned that chemicals from these processes may contaminate the beaches and endanger the marine ecosystem, already at risk from pollution and offshore drilling. These Pacific beaches were where her family came to spend summer nights — grilling hot dogs, catching fish in the moonlight, and sleeping in the dunes. And she wants to see countless more generations enjoy them. Don’t let the white hair pulled back into a bun fool you. Or the fact that she used to be a nun. 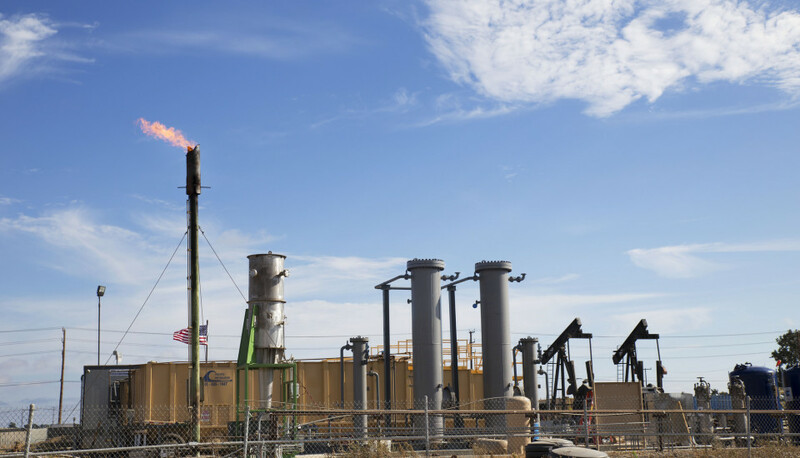 Up until the beginning of 2014, neither fracking nor acidizing had been of special interest to California’s Department of Oil, Gas, and Geothermal Resources (DOGGR), despite the fact that there was outcry across the country over fracking’s impacts on air, water, and health. Finding out what was happening at well sites in California involved a lot of guesswork and snooping. Industry is not usually forthcoming about what they are doing and state agencies, which should have been regulating the processes, have been asleep at the wheel. Some of the information can be found by reading through pages and pages of well records, if you happen to know the API number of a specific well. The website FracFocus popped up a couple of years ago to compile information about fracking, but it only has what industry in California is willing to share — a sliver of reality. In Ventura County, where Oxnard is located, the incomplete patchwork of data I can find shows 457 wells have been stimulated, most of them fracked, and most of them in the larger fields like the Sespe and Ojai, about 30 miles away. 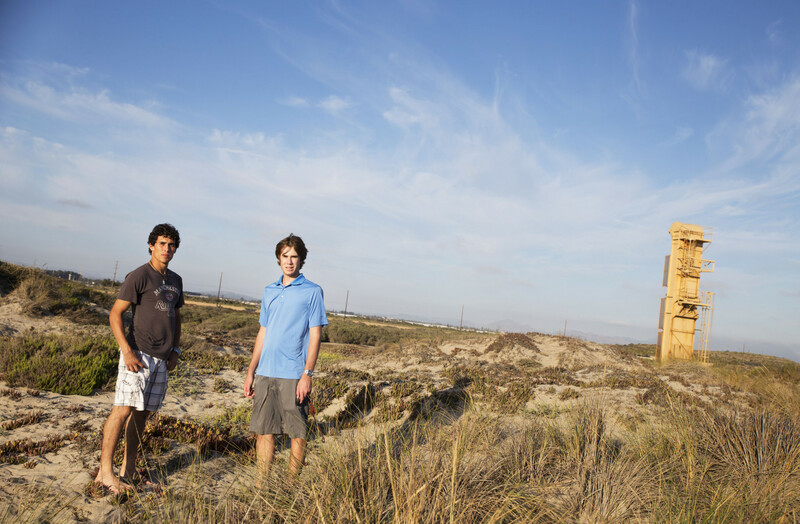 Two wells have been fracked in the Oxnard Oil Field, which underlies the town of Oxnard. Lupe and I can drive endlessly around Oxnard and surrounding Ventura County, but we’ll still be at a loss to really understand what’s happening until at least a year from now when new regulations may give more clarity — although perhaps not more protection. The state passed California Senate Bill 4 (SB4), which went into effect in January 2014, putting in motion a plan to draft regulations for well stimulation techniques like fracking and acidizing. The gist of SB4 is that DOGGR has admitted it needs to study what’s happening, disclose more of it to the public, and write some actual regulations. This should all be completed by July 2015, but in the meantime it’s essentially business as usual for industry. After we leave the beach, our next stop is across town at a facility run by Anterra, a wastewater disposal company. The facility is ringed with strawberries ready for harvest. Workers stoop in the fields. The air smells like thick, sweet jam. It’s such a contrast to what is being injected underground, thousands of feet below the surface. 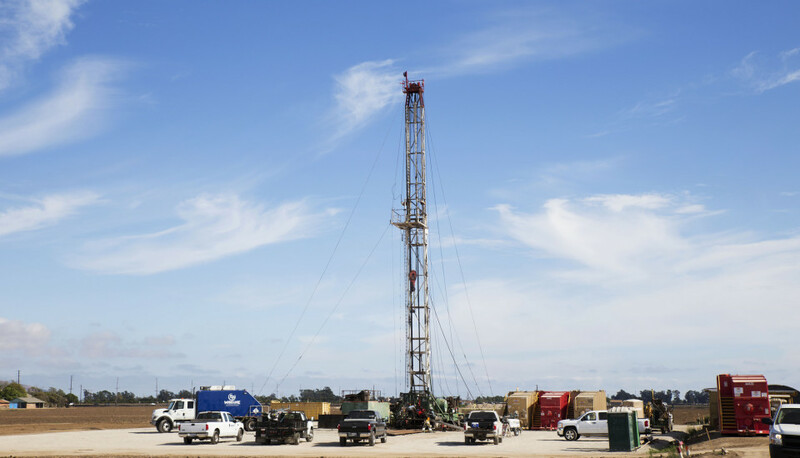 Anterra operates two deep injection wells here, known as Class II wells, which funnel wastewater (including fracking chemicals) from oil and gas production into the underground belly of the Monterey and Topanga formations, 4,500 to 5,600 feet deep. The water arrives via tanker trucks hauling from drilling operations in Ventura, Los Angeles, and Kern — the three biggest oil-producing counties in the state. In the first half of 2014, Anterra injected 114,170 barrels (or 4.8 million gallons) in one of the wells and 337,215 barrels (or about 14 million gallons) in the other well. Together, in just six months, these two wells gulped down enough wastewater to fill more than 28 Olympic-sized swimming pools. This water can contain a whole litany of things you don’t want to have anywhere near water you drink or put on your crops. This includes radioactive materials, known human carcinogens such as benzene, and hundreds of chemicals that may be contained in fracking fluid — some of which are never even disclosed. Lupe is concerned about those chemicals ending up in the food that is grown in Oxnard and the water people drink, half of which comes from underground aquifers. And she’s also concerned with the workers who harvest in the fields, some of them right next to these injection wells. Anterra is not earning a lot of community trust — it has been cited for violations in the past and in September Anterra’s corporate office was raided by investigators from the Ventura County District Attorney’s office. DOGGR says the disposal practice is safe, but they also shut down 10 similar wells in Kern County in July because they believed the companies may have been injecting wastewater into aquifers that could be used for drinking. Water contamination is a big deal but not the only risk. The ground here also has a life of its own — this is seismically active California after all, and Oxnard is designated as a liquefaction and landslide zone (not to mention a tsunami evacuation area), surrounded by fault zones. The prospect of earthquakes worry Lupe. As we drive along the coast, she points to the homes that sit close to the water’s edge in neighborhoods deemed liquefaction and tsunami danger areas. Two of her friends — 19-year-olds Dallas Rippy and JB (Jose Barrera) — are also concerned. Both are studying political science at Ventura College and are youth directors for LULAC. They’ve also both done their homework on the risks of fracking, and Dallas grew up around the industry — his father worked for more than 30 years in the oil fields. But that’s not all. Rippy mentions recent research showing that some deep injection wells have been linked to earthquakes in other states, like Oklahoma. From 1997 to 2008, Oklahoma had about one to three earthquakes a year. Since 2009 they have been having more than 40 a year. A study published in Science confirmed that the rise in earthquakes there “is likely caused by fluid migration from wastewater disposal wells.” Oklahoma is one of six states — along with Texas, Colorado, New Mexico, Arkansas, and Ohio — that have all had earthquakes linked to injection wells. Induced seismicity depends on a number of factors including how much water is injected, how fast, and how permeable the rock is. Under the right (really, wrong) conditions, pressure can build up and if this pressure is relayed to a nearby fault that is stressed it can reduce the friction on that fault and cause it to slip. Should Lupe and her friends be concerned about the same thing happening in California? DOGGR currently reports it oversees more than 50,000 injection wells, of which it says only 60 percent are inspected each year by a staff of 35. A recent report about the risks of earthquakes, On Shaky Ground, looked at the 2,583 wastewater injection wells in the state and found 54 percent of the ones currently in use are within 10 miles of an active fault. When I checked with the state’s Department of Conservation (of which DOGGR is part), Don Drysdale told me, “There appears to be no correlation between the seismic activity in the state and the routine injection of wastewater from oil and gas activities.” Even though wastewater injections wells have been linked to earthquakes in other states, the agency doesn’t think the same thing could happen in California. But Don admits, the state is now required to study the potential, thanks to requirements from SB4. This last bit of information makes me wonder how DOGGR came to its conclusion before it even studied the issue. Our last stop of the day may be our most troubling. After leaving Anterra’s injection wells we find two nearby industrial sites, one run by Peak and the other by Vaca Energy, separated by a few hundred yards of tractor-turned dirt rows. Peering beyond the fences and open driveways we see clusters of tanks, metal piping, and pumpjacks. The sign at the second one gives away the mission: “Drilling into the past to secure the future.” The past they are after is from more than 2 million years ago. Both companies are permitted to use an “enhanced oil recovery” technique known as cyclic steam injection. About 1,800 to 5,000 feet below the surface of their operations is a zone known as the Vaca Tar Sand and then just below that the Lower Pliocene Tar Sand. A 1982 report from DOGGR on the state’s “unconventional petroleum reserves” describes the thick crude down there as “extremely poor quality.” It’s also extremely dirty to burn. But companies like Peak and Vaca Energy are after it these days because the price of oil is high enough to warrant spending lots of energy and water extracting some of the most polluting fossil fuels we can find. Unconventional fossil fuels like tar sands are produced now via horizontal drilling and cyclic steam injection to get the crude hot enough (and therefore liquid enough) that it can be pumped to the surface. The end product is one that runs completely counter to any progress toward reducing greenhouse gas emissions in the face of a warming and more volatile climate. And makes little sense in a state struggling to cope with extreme drought. Oxnard’s Mayor Pro Tem Carmen Ramirez told me she’s concerned about the area’s water supply — both having enough of it and having it be contaminated by the oil industry. Cyclic steam injection is classified differently than well stimulation techniques like fracking and it’s not covered under the new regulations that will be written as a result of SB4, so it’s likely that few people will even notice that Oxnard’s oil industry is scraping the bottom of the barrel for tar sands. As Lupe and I sit outside their facilities we only have an inkling of what’s going on and it doesn’t smell good. In fact, the emissions of burned gases and chemicals coming from a flare at one of the facilities makes Lupe ill. She clutches her chest, and we drive off. When I drop her off after our day together, I can already see the wheels turning in her head — the emails she is going to write, the organizers she’ll call, the meetings she’ll attend. It’s like she is still guided by the mantra “what’s next, what’s next.” I imagine it rolling over and over in her mind like waves.